Holly's Horrorland: Monster Monday: Beetlejuice! Beetlejuice! Beetlejuice! Monster Monday: Beetlejuice! Beetlejuice! Beetlejuice! I've decided to post about the ghost with the most! That's definitely a creepy curiosity, eh? which you can read about here. except Michael Keaton is the man! in celebration of International Bat Night! Ghostbusters will be in theaters this weekend too! You can find out where it's showing here. between these two terrific ones, so I created a poll. I'm still waiting for them to do that Beetlejuice sequel, "Beetlejuice goes Hawaiian". 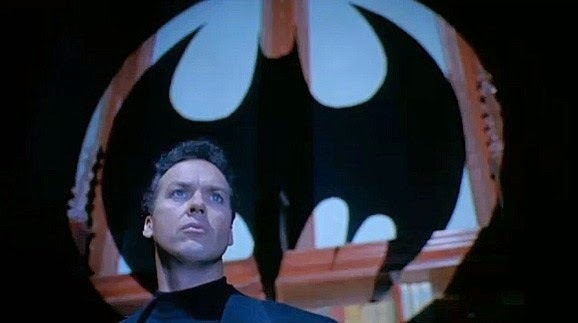 I hear Michael Keaton is stoked to reprise the role, and I'm stoked to see him do it. I think the Ghostbusters would probably win though, considering that they've already taken down an eldritch god and all. But the fight would be fun to watch. Excellent as always,Holly! Living near Pittsburgh most of my life,I remember the pre-fame Michael Keaton on local shows such as Mr. Rogers Neighborhood! : ) Happy birthday,Tim Burton!!! Ghostbusters made more of an impact on me when I was younger, I loved it. I didn't start appreciate Tim Burton until I was an adult. Well, it was a VERY close fight, but the Ghostbusters won! Check out their victory post here!